For instance, it's common for water to migrate into the structural components of bridges, potentially weakening them in a variety of ways. Freeze-thaw cycles that are so common in this part of the country further increase the width and depth of many of these cracks, accelerating deterioration of the concrete. Chlorides can also work their way deep into the bridge deck, where they corrode reinforcing steel. Increasing the longevity of updated bridge decks is key to collectively improving Pennsylvania's bridges for the long-term. To achieve this goal, reductions in early-age cracking are imperative. Early-age cracking occurs after construction but before the new bridge deck is put into service. Research conducted at Penn State University (PSU) identifies ways to improve the longevity of concrete bridge decks. Beginning in 2008, the PA concrete industry and PennDOT collaborated to better understand and mitigate cracking, including the development of AAAP mixes that limited changes in concrete volume. In 2009-2010, 10 field tests compared AAAP and AAA. Field testing of AAA and AAAP concrete mixes led to "The AAAP Bridge Deck Concrete Initiative." The study was sponsored by three major agencies, the Pennsylvania Department of Transportation (PennDOT), U.S. Department of Transportation (DOT) and Federal Highway Administration (FHA). The results were conclusive. 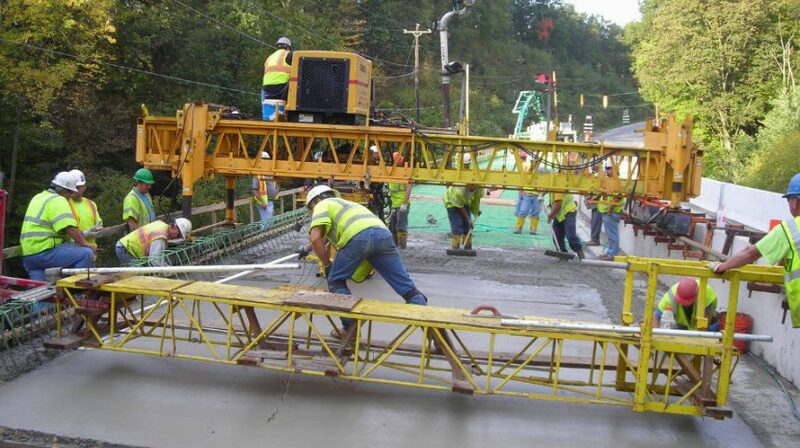 Today, the American Council of Engineering Companies of Pennsylvania (ACEC/PA) specifically states there should be no AAA concrete on new bridge decks. Pozzolans limit the potential for thermal cracking by reducing the rate of hydration. Lower hydration rates reduce set times, temperature increases and premature strength development. A 2015 study yielded a report entitled "Bridge Deck Cracking: Effects on In-service Performance, Prevention and Remediation," which further identified ways to mitigate cracking on bridge decks. Specifically, the maximum cementitious content can be reduced from 690 pcy to 620 pcy. Also, it is ideal to limit evaporation rates to 0.10 lbs/SF/hr. The use of fine lightweight aggregates (FLWA) promotes internal curing. The CP Road Map identifies additional sources of bridge deck cracking. Ultimately, it is incumbent upon all stakeholders to better deter moisture and chloride ingress. The Pennsylvania Aggregates and Concrete Association (PACA) is dedicated to the dissemination of emerging news about the effective use of concrete. For further information, please contact us.